In terms accessible to non-economists, Marcos José Mendes describes the ways democracy and inequality produce low growth in the short and medium terms. In the longer term, he argues that Brazil has two paths in front of it. One is to create the conditions necessary to boost economic performance and drive the country toward a high level of development. The other is to fail in untying the political knot that blocks growth, leaving it a middle-income country. 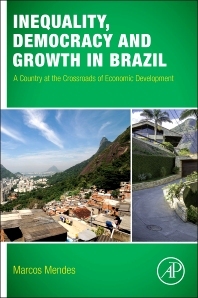 The source of his contrasting futures for Brazil is inequality, which he demonstrates is a relevant variable in any discussion of economic growth. Inequality illuminates causes of seemingly-unconnected problems. This book, which includes freely-accessible documents and datasets, is the first in-depth analysis of an issue that promises to become increasingly prominent. Upper-division undergraduates and graduate students working in economics and finance as well as professionals studying Latin America and developing countries in general. 2.4 Will inequality continue to fall? 2.5 Are social policies effective in reducing inequality? 2.6 Did inequality only begin to fall more intensely as of 2001? 3.2 What does economic theory have to say? 4.2 What does economic theory have to say? 5.2 What does economic theory have to say? 6.2 What does economic theory have to say? 6.3 Which path will brazil take? fellowship at the Department of Economics at the London School of Economics.